Progression to AIDS is often associated with the evolution of HIV-1 toward increased virulence and/or pathogenicity. Evidence suggests that a virulence factor for HIV-1 is resistance to CCR5-binding chemokines, most notably RANTES, which are believed to play a role in HIV-1 control in vivo. HIV-1 can achieve RANTES resistance either by phenotypic switching from an exclusive CCR5 usage to an expanded coreceptor specificity, or by the acquisition of alternative modalities of CCR5 usage. An infectious agent that might promote the evolution of HIV-1 toward RANTES resistance is human herpesvirus 6A (HHV-6A), which is frequently reactivated in HIV-1-infected patients and is a potent RANTES inducer in lymphoid tissue. SIV isolates obtained from pig-tailed macaques (M. nemestrina) after approximately one year of single infection with SIVsmE660 or dual infection with SIVsmE660 and HHV-6AGS were characterized for their growth capacity and sensitivity to HHV-6A- and RANTES-mediated inhibition in human or macaque lymphoid tissues ex vivo. Four out of 4 HHV-6A-coinfected macaques, all of which progressed to full-blown AIDS within 2 years of infection, were found to harbor SIV variants with a reduced sensitivity to both HHV-6A and RANTES, despite maintaining an exclusive CCR5 coreceptor specificity; viruses derived from two of these animals replicated even more vigorously in the presence of exogenous HHV-6A or RANTES. The SIV variants that emerged in HHV-6A-coinfected macaques showed an overall reduced ex vivo replication capacity that was partially reversed upon addition of exogenous RANTES, associated with suppressed IL-2 and enhanced IFN-γ production. In contrast, SIV isolates obtained from two singly-infected macaques, none of which progressed to AIDS, maintained HHV-6A/RANTES sensitivity, whereas the only AIDS progressor among singly-infected macaques developed an SIV variant with partial HHV-6A/RANTES resistance and increased replication capacity, associated with expanded coreceptor usage. These results provide in vivo evidence of SIV evolution toward RANTES resistance in macaques rapidly progressing to AIDS. RANTES resistance may represent a common virulence factor allowing primate immunodeficiency retroviruses to evade a critical mechanism of host antiviral defense. Although HIV-1 is the necessary and sufficient causative agent of AIDS , progression to full-blown immunodeficiency is associated with de novo infection with or reactivation of a wide variety of other microbial agents. While coinfection with some agents has been associated with reduced HIV-1 loads and delayed AIDS progression [2–5], most of these microbes accelerate the clinical course either by inducing opportunistic diseases or by enhancing the level of HIV-1 replication . However, the mechanisms whereby these agents operate in vivo remain largely unknown. Several lines of clinical and experimental evidence suggest that human herpesvirus 6 (HHV-6), particularly its A variant (HHV-6A), acts as an accelerating factor in HIV-1 disease . In vitro, HHV-6A was shown to: i) replicate primarily in CD4+ T cells and cause their destruction in synergy with HIV-1 ; ii) transactivate the HIV-1 long terminal repeat ; iii) induce de novo CD4 expression and HIV-1 susceptibility in otherwise HIV-refractory cells such as CD8+ T lymphocytes and NK cells [10, 11]; and iv) augment the release of HIV-1-enhancing inflammatory cytokines . In vivo studies have documented: i) widespread HHV-6 infection in patients with full-blown AIDS at post-mortem examination [13, 14]; ii) frequent reactivation of HHV-6 in early symptomatic HIV-1-infected subjects ; iii) vigorous HHV-6 replication in lymph nodes of HIV-1-infected subjects, associated with an increased local HIV-1 load [16, 17]; and iv) accelerated progression of HIV-1 disease in infants who acquire HHV-6 within the first year of life . In addition, we recently provided evidence that in vivo coinfection with HHV-6A accelerates the course of simian immunodeficiency virus (SIV) disease in pig-tailed macaques (M. nemestrina) . The availability of the experimental model of pig-tailed macaques coinfected with SIV and HHV-6A gave us a unique opportunity to investigate the effects of a disease-accelerating viral cofactor on the evolution of SIV during the course of AIDS progression. We report here that rapidly progressing HHV-6A-coinfected macaques invariably harbored RANTES-resistant and even RANTES-inducible SIV variants, which nevertheless maintained a CCR5-dependent phenotype. These results provide the first demonstration of SIV evolution toward RANTES resistance under the influence of a coinfecting microbe, illustrating a potential mechanism for the accelerated progression to full-blown AIDS seen in HHV-6A-coinfected macaques. SIV was isolated from 7 macaques, three singly infected with SIV, strain smE660 (#301, 303, 307), and 4 coinfected with SIV and HHV-6A, strain GS (#313, 315, 316, 317), after 10 to 12 months of infection. For this purpose, freshly isolated PBMC were obtained from each animal and cultured in vitro after stimulation with PHA and IL-2, leading to the appearance of increasing levels of SIV p27 antigen in the culture supernatants, as assessed by ELISA. Virus isolation was attempted from a fourth singly-infected animal (#299), but it was unsuccessful. The SIV isolates were cleared of cells and cellular debris by centrifugation, characterized for SIV p27 antigen content and frozen in aliquots at -80°C. HHV-6 contamination of the SIV stocks was excluded using a real-time PCR assay with a lower sensitivity of < 10 HHV-6 genome copies/ml . Human tonsils were received from the Children's National Medical Center, Washington, DC, according to an IRB-approved protocol, and tissue blocks were processed and infected as described [21, 22]. Lymph nodes from SIV-seronegative macaques (M. mulatta) were processed likewise. In a typical experiment, 3.3 μl of clarified stock of SIV (~1 ng of p27) were applied onto the top of each tissue block. Infected tissue blocks were cultured for 12 days and SIV replication was assessed by a commercial p27 ELISA (Beckman-Coulter, Miami, FL). Recombinant human RANTES (Peprotech, Rocky Hill, NJ) was added to the culture media at 100 nM for 18 hour prior to SIV infection and maintained at the same concentration thereafter. The medium was changed every 3 days and RANTES was re-added at every medium change. For HHV-6A infection, the tissue blocks were inoculated with 10 μl of the viral stock, strain GS , containing ~106 cell culture infectious doses/ml, produced by infecting PHA-activated human PBMC and by collecting cell-free culture supernatants at the time of peak cytopathic effect (typically at day 6 to 8 post-infection) . PBMC obtained from randomly selected healthy donors or from a homozygous CCR5-Δ32+/+ donor were activated with phytohemagglutinin-P (PHA-P) (Difco, Franklin Lakes, NJ) at 2 μg/ml in RPMI 1640 supplemented with 15% FBS and 100 U/ml rhIL-2 (Roche Molecular Biochemicals, Nutley, NJ). The cells were then exposed to SIV for 3 hours at the multiplicity of infection of 0.01, washed and re-cultured in medium containing IL-2. Cytokine levels were measured using a multiplex bead array on a Luminex-100 platform. All antibodies and cytokine standards were purchased from R&D Systems (Minneapolis, MN). Luminex bead sets were coupled to cytokine-specific antibodies, washed and kept at 4°C until use. All the assay procedures were performed in PBS supplemented with 1% normal mouse serum, 1% normal goat serum, and 20 mM Tris-HCl (pH 7.4). The assays were performed using 1,200 beads per set per well in a total volume of 50 μl. Fifty μl of each sample were added to the well and incubated overnight at 4°C in a Millipore Multiscreen plate. After 3 washes with PBS, the beads were incubated with biotinylated polyclonal antibodies for 1 hour at room temperature, then washed 3 times with PBS, resuspended in 50 μl of assay buffer, and treated with streptavidin-PE (Molecular Probes, Carlsbad, CA) at 16 μg/ml. The plates were read on a Luminex-100 platform. For each bead set, a total of 61 beads were collected. Due to extensive donor-to-donor variation in this model [22, 24], data were normalized as percent of controls. Statistical analyses included the calculation of mean and SE and P values by use of multiple comparison tests (2-way ANOVA test or a paired student t-test). ELISA data were analyzed with the Deltasoft software (version 3.0; BioMetallics); Luminex data with the Bioplex Manager software (version 4.0; Bio-Rad) using the median fluorescence intensity recorded for 61 beads from each set. For the purpose of this study, we selected 7 SIV isolates obtained after approximately 1 year of inoculation from three macaques singly-infected with SIV and 4 macaques coinfected with HHV-6A and SIV. By ultra-sensitive real-time PCR, we first ascertained that none of the SIV stocks was contaminated by HHV-6 (not shown). Human and macaque lymphoid tissues were exposed to the SIV isolates without exogenous stimulation. For each viral isolate, tissues derived from 11 to 15 different human donors were tested; for each tissue, 27 blocks were infected ex vivo with comparable doses of each viral stock, and the presence of p27 viral protein in the tissue culture supernatant was measured by ELISA every 3 days. As shown in Fig. 1A, all 7 SIV isolates were able to replicate in human lymphoid tissue. However, the cumulative level of virus replication was significantly higher for SIV isolates derived from singly-infected animals (mean = 19 ± 3 ng/ml; n = 37) compared to those derived from HHV-6A-coinfected animals (mean = 5 ± 1 ng/ml; n = 51) (P = 1 × 10-5) (Fig. 1B). Of note, the highest replication levels were observed with isolate #303, obtained from the only animal in the singly-infected group which progressed to full-blown AIDS before termination of the in vivo study . Ex vivo infection of lymphoid tissue by SIV isolates obtained from singly-infected or HHV-6A-coinfected macaques. Blocks of human (A, B) or macaque (C) lymphoid tissue were inoculated with different SIV isolates, and viral replication was evaluated by measuring the level of p27 antigen accumulated in the culture medium every 3 days over 12 days of culture. For each donor, 27 tissue blocks were inoculated. The data indicate the mean values (± SEM) of SIV replication. A. Replication in human lymphoid tissue of SIV isolated from singly-infected macaques (#301 n = 11; #303 n = 15; #307, n = 12) and HHV-6A-coinfected macaques (#313, n = 15; #315, n = 11; #316, n = 15; #317, n = 13). B. Comparison of the viral replication levels in tissues infected SIV isolates derived from singly-infected animals (n = 37) versus those derived from HHV-6A-coinfected animals (n = 51). The data represent the mean level of replication (± SEM) for all the isolates tested in each group. * = P < 0.001. C. Replication of SIV #303, derived from a singly-infected animal (black line), and SIV #316, derived from an HHV-6A-coinfected animal (grey line), in macaque lymphoid tissue (n = 3). Next, we assessed the ability of two representative SIV isolates to replicate in macaque lymphoid tissue, which is more relevant to the in vivo model from which they were derived. The two isolates that exhibited the most divergent replication capacities in human lymphoid tissue were selected (#303, derived from a singly-infected animal, and #316 derived from an HHV-6A-coinfected animal). As shown in Figure 1C, the average replication levels of these two isolates in macaque lymphoid tissue were strikingly different (94.0 ± 3 ng/ml for #303, and 2.2 ± 0.2 ng/ml for #316 (n = 3)) with a pattern similar to that observed in human lymphoid tissue, thus ruling out the presence of selective inhibitory mechanisms in human tissue and confirming that the replicative capacity of SIV passaged in vivo with HHV-6A was intrinsically altered. HHV-6A was previously shown to suppress the growth of CCR5-dependent (R5) HIV-1 strains in lymphoid tissue . 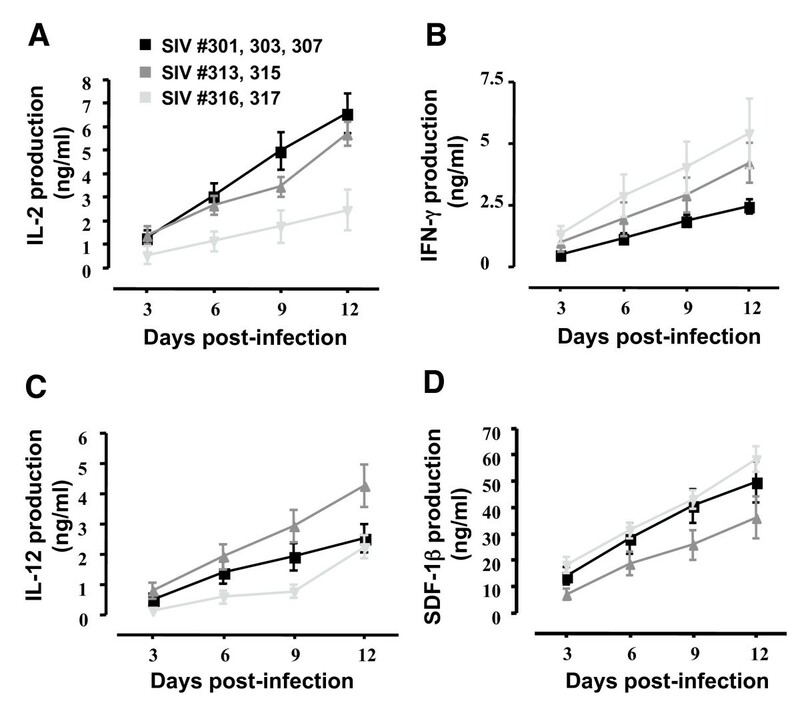 Since SIV typically depends on CCR5 for infection, we evaluated the sensitivity of SIV isolates derived from singly-infected and HHV-6A-coinfected macaques to inhibition by exogenous HHV-6A. Human lymphoid tissues were infected ex vivo with each of the 7 SIV isolates in the presence or absence of HHV-6A, strain GS. A spectrum of different sensitivities to HHV-6A-mediated inhibition was observed. As typically seen with R5 HIV-1 in this model , as well as with the original SIVsmE660 used for inoculation (not shown), SIV isolates derived from animals #301 and #307 (singly SIV-infected) were significantly inhibited by HHV-6A (mean virus replication: 56.1 ± 24% (n = 2, P = 4 × 10-2) and 38.0 ± 4% (n = 3, P = 2 × 10-2), respectively, relative to HHV-6A-untreated controls) (Fig. 2A, B). Of note, neither of these two animals progressed to full-blown AIDS during the 32-month follow-up of the in vivo study . By contrast, the third isolate from the singly-infected group (#303) showed a partial resistance to HHV-6A (mean replication: 87.3 ± 11% in the presence of HHV-6A relative to HHV-6A-untreated controls (n = 4, P = 1.6 × 10-1) (Figure 2C). As stated above, macaque #303 was the only AIDS progressor within the singly SIV-infected group . Sensitivity of SIV isolates derived from singly-infected and HHV-6A-coinfected macaques to RANTES- and HHV-6A-mediated inhibition. Blocks of human lymphoid tissues were infected with SIV isolates or coinfected with HHV-6A. Tissues were cultured with or without exogenous RANTES (100 nM). The data indicate means (± SEM) of cumulative viral replication levels expressed as percent of the levels measured in untreated controls. As expected in this model system, the range of SIV replication in different donor tissues was extremely variable (range: 150–19,000 pg/ml of p27 antigen). * = Statistically significant difference from the control. A-C. SIV isolates derived from singly SIV-infected animals. A: #301 (2 ≤ n ≤ 4); B: #307 (2 ≤ n ≤ 6); C: #303 (4 ≤ n ≤ 12). D-G. SIV isolates derived from HHV-6A-coinfected animals. D: #313 (4 ≤ n ≤ 11); E: #315 (2 ≤ n ≤ 4); F: #316 (3 ≤ n ≤ 10); G: #317 (3 ≤ n ≤ 7). Strikingly, all the SIV isolates derived from HHV-6A-coinfected animals showed resistance to HHV-6A-mediated inhibition. Two isolates (#313, 315) replicated at similar levels regardless of the presence of HHV-6A (mean replication: 106 ± 20% (n = 5, P = 3.6 × 10-1) and 103 ± 38% (n = 3, P = 9.3 × 10-1), respectively, relative to controls cultured in the absence of HHV-6A) (Fig. 2D, E), while the other two (#316, 317) replicated even more vigorously in the presence than in the absence of HHV-6A (mean replication: 267 ± 80% (n = 5, P = 4 × 10-2) and 151 ± 26% (n = 3, P = 3 × 10-2), respectively) (Fig. 2F, G). Overall, even with the inclusion of the partially resistant isolate #303, the average level of HHV-6A sensitivity was significantly lower among isolates derived from HHV-6A-coinfected monkeys (P = 1 × 10-4, n = 8). It has to be emphasized that all the animals in the coinfected group progressed to full-blown AIDS during the 32 months of the in vivo study . These data demonstrated that, upon in vivo coinfection with HHV-6A, SIV evolved to develop resistance to the inhibitory effects of HHV-6A. We previously demonstrated that HHV-6A induces a dramatic upregulation of RANTES, which could explain the selective suppression of R5 HIV-1 isolates documented in HHV-6A-coinfected human lymphoid tissue ex vivo . Thus, we compared the sensitivities of SIV isolates obtained from singly-infected and HHV-6A-coinfected macaques to RANTES-mediated inhibition. Donor-matched blocks of human lymphoid tissues were infected with the 7 SIV isolates in the presence or absence of exogenous RANTES at 100 nM, a high dose that was previously determined to inhibit by more than 95% the growth of a reference R5 HIV-1 isolate (SF162) in this model (not shown). RANTES was maintained at the same concentration throughout the entire time of the experiments (12 days). Among the three SIV isolates derived from singly-infected macaques, two (#301, 307) were sensitive to RANTES-mediated inhibition (mean replication in the presence of 100 nM RANTES: 58.1 ± 12% (n = 14, P = 4.2 × 10-2) and 67.8 ± 12% (n = 13, P = 4.8 × 10-2), respectively, relative to controls) (Fig. 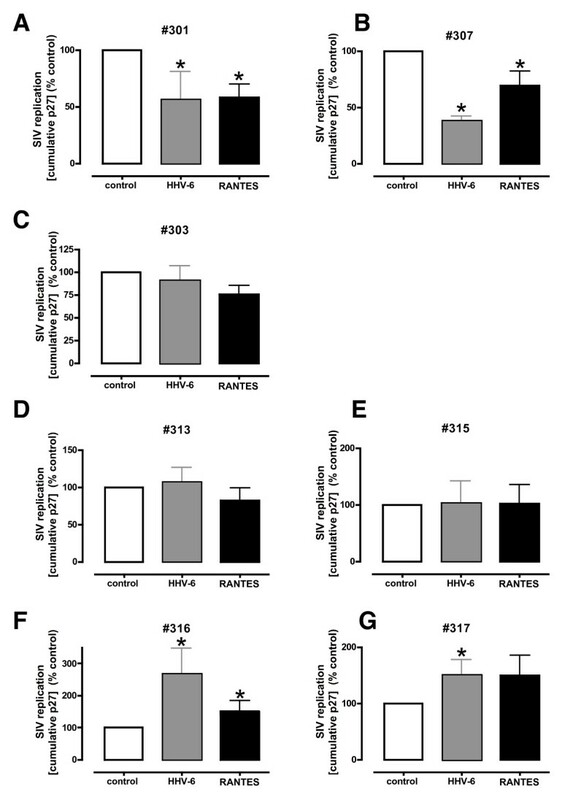 2A, B), while the third (#303), which had shown partial resistance to HHV-6A, also had a decreased sensitivity to RANTES (mean replication: 75.4 ± 10% relative to control) (Fig. 2C). In contrast, all the SIV isolates derived from HHV-6A-coinfected animals were resistant to inhibition by RANTES at the dose used: two (#313, 315) replicated at similar levels in the presence or absence of exogenous RANTES (mean replication: 82 ± 17% (n = 11, P = 3.5 × 10-1) and 102 ± 33% (n = 4, P = 9.5 × 10-1), respectively) (Fig. 2D, E), while the remaining two (#316, 317) replicated even more vigorously in the presence of RANTES (mean replication level: 150.2 ± 34% (n = 10, P = 4 × 10-2) and 149.2 ± 30% (n = 7, P = 2 × 10-1), respectively, relative to untreated controls) (Fig. 2F, G). Of note, the latter two isolates were the same that grew more efficiently in the presence of HHV-6A, corroborating the concept that RANTES induction is a potential mechanism of modulation of SIV replication by HHV-6A. Overall, the average sensitivity to RANTES-mediated inhibition between isolates derived from singly-infected and HHV-6A-coinfected animals was significantly different (P = 5 × 10-5). Next, we aimed to determine whether the RANTES resistance/inducibility developed by SIV in HHV-6A-coinfected animals was associated with an altered coreceptor usage. First, all SIV isolates were tested for their ability to infect cells from a healthy, HIV-1-seronegative human subject homozygous for the CCR5-Δ32 deletion. As shown in Table 1, none of the isolates was able to replicate in CCR5-Δ32+/+ CD4+ T cells with the only exception of isolate #303. This isolate was the only one within the group obtained from singly SIV-infected monkeys to show partial resistance to HHV-6A- and RANTES-mediated inhibition. These results suggested that in this animal (the only AIDS progressor in the singly-infected group), SIV had evolved to use alternative coreceptors during the progression of the disease. Replication of SIV isolates derived from macaques infected with SIV alone or coinfected with SIV and HHV-6A in primary human T cells and coreceptor-transfected Ghost cell lines. The reference HIV-1 isolates BaL (R5) and LAV (X4) were tested in parallel as controls. - = no replication; + = weak replication; ++/+++ = strong replication; n.d = not determined. To more precisely characterize the coreceptors used by the 7 SIV isolates, we tested their ability to grow in a human osteosarcoma cell line (Ghost) engineered to express several chemokine receptors that can be used as coreceptors by HIV-1 and SIV, including Bonzo, CX3CR1, CCR2b, CCR3, CCR4, CCR6 and CCR8. Table 1 shows that none of the isolates, including #303, had the ability to grow in CXCR4-expressing Ghost cells. Of note, all the isolates were able to use, with variable efficiency, some of the minor coreceptors, but this ability did not permit to differentiate the two groups of isolates, suggesting that their differential sensitivity to HHV-6A- or RANTES-mediated inhibition could not be ascribed to the use of alterative coreceptors. To further investigate the mechanisms underlying the altered replicative capacity of the SIV isolates obtained from HHV-6A-coinfected macaques, we compared the profiles of cytokine secretion in culture medium of donor-matched lymphoid tissues (n = 5) infected with SIV isolates derived from singly-infected vs. HHV-6A-coinfected monkeys. The concentration of 17 cytokines was measured using a multiplex bead-based assay. For 15 cytokines, multiple comparison analysis by 2-way ANOVA showed no significant differences between tissues infected with the two groups of SIV isolates (Table 2). By contrast, the levels of IL-2 and IFN-γ, two cytokines that effectively modulate HIV/SIV replication, were significantly different between the two groups. As shown in Table 2, the production of IL-2 was higher in tissues infected with SIV derived from singly-infected animals (P = 4.8 × 10-2); conversely, the production of IFN-γ was higher in tissues infected with SIV derived from HHV-6A-coinfected animals (P = 1.8 × 10-2). Of note, the two groups of isolates did not differ in their ability to induce RANTES, further confirming the lack of HHV-6 contamination of our SIV stocks. This analysis demonstrated that the two groups of SIV isolates possess distinctive biological features, suggesting potential mechanisms for their differential replication capacity. Cytokine production in lymphoid tissue infected with SIV derived from macaques infected with SIV alone or coinfected with SIV and HHV-6A. Since the 4 SIV isolates derived from HHV-6A-coinfected animals exhibited different degrees of RANTES resistance, we compared the cytokine profiles in tissues infected with the two RANTES-resistant isolates (#313, 315) vs. those infected with the two RANTES-inducible isolates (#316, 317). As shown in Figure 3A, the levels of IL-2 were significantly lower upon infection with RANTES-inducible isolates (2.4 ± 0.9 ng/ml; n = 5) than with RANTES-resistant isolates (5.7 ± 0.5 ng/ml; n = 10) (P = 4 × 10-2). Likewise, the levels of IL-12 were lower in tissues infected with RANTES-inducible isolates (2.2 ± 0.4 ng/ml; n = 8 vs. 4.2 ± 0.7 ng/ml; n = 8; P = 1 × 10-2) (Fig. 3B). By contrast, the levels of SDF-1β were higher in tissues infected with RANTES-inducible isolates (58.3 ± 0.5 ng/ml; n = 8) than with RANTES-resistant isolates (36.2 ± 0.8 ng/ml; n = 8) (P = 7 × 10-2) or with isolates derived from singly-infected animals (49.8 ± 0.8 ng/ml; n = 13) (P = 5 × 10-2) (Fig. 3D). A similar trend, albeit not statistically significant, was observed for IFN-γ (Fig. 3B). These results confirmed the inherent biological alterations of SIV after in vivo passage in the presence of HHV-6A, suggesting that the RANTES-inducible isolates, which showed the highest ability to suppress IL-2 and induce IFN-γ, may represent a more advanced evolutionary stage than the RANTES-resistant isolates. Cytokine secretion profiles in human lymphoid tissue infected with SIV isolates obtained from singly-infected and HHV-6A-coinfected macaques. Blocks of human lymphoid tissue were infected with SIV isolates. The concentrations of IL-2 (A), IFN-γ (B), IL-12 (C), and SDF-1β (D) were measured in conditioned culture medium from 27 tissue blocks using a multiplex bead-based assay. The data indicate the mean (± SEM) concentrations of each cytokine accumulated in the culture medium over 12 days in experiments with tissues from 5 human lymphoid tissue donors. Black: SIV from singly-infected macaques (#301, 303, 307); dark grey: RANTES-resistant SIV isolated from HHV-6A-coinfected macaques (#313, 315); light grey: RANTES-inducible SIV isolated from HHV-6A-coinfected macaques (#316, 317). Progression toward full-blown AIDS is often associated with the evolution of HIV-1 toward increased virulence or pathogenicity. In a proportion of patients, HIV-1 acquires the ability to use CXCR4 as a coreceptor, becoming resistant to the inhibitory effects of endogenous CCR5-binding chemokines, such as RANTES, that are believed to play a critical role in the early containment of HIV-1 replication . This phenotypic switch is typically accompanied by an accelerated loss of CD4+ T cells. Strikingly, the emergence of more aggressive viral strains, including RANTES-resistant variants, has also been documented in patients who progress to full-blown AIDS without a change in viral coreceptor usage [27–29], focusing attention on the role played by RANTES resistance as a virulence factor for HIV-1. The mechanisms driving the in vivo evolution of HIV-1 are poorly understood at present, although an increase in the levels of endogenous RANTES, as typically occurs in inflamed lymphoid tissues, is likely to play a role. In this paper, we investigated these mechanisms taking advantage of the model of in vivo coinfection with SIV and HHV-6A in macaques  and the ex vivo model of human and macaque lymphoid tissue explant systems . Our results indicate that SIV isolates obtained from HHV-6A-coinfected animals underwent a dramatic biological evolution in vivo, with the emergence of viral strains with a reduced sensitivity to RANTES-mediated inhibition, despite the maintenance of a strict dependence on CCR5 as a coreceptor. In two animals, the SIV isolates even exhibited a RANTES-inducible phenotype, as they replicated more vigorously in the presence than in the absence of exogenous RANTES. We recognize that the study of a larger number of animals would provide additional ground to the conclusions of this study, but unfortunately studies in nonhuman primates are often hindered by the limited number of animals that can be enrolled. Nevertheless, we believe that the observation that 4 out of 4 HHV-6A-coinfected animals harbored RANTES-resistant SIV strains after 1 year of infection corroborates the conclusions of this study even in the absence of a larger sampling size. Since our experiments were performed using RANTES at a single dose, albeit high (100 nM), we cannot formally exclude that some SIV isolates would be inhibited at even higher chemokine concentrations, thus showing a reduced sensitivity to RANTES rather than bona fide resistance. However, the physiological relevance of RANTES concentrations above 100 nM remains to be established. Moreover, at least with the two SIV isolates with a RANTES-inducible phenotype (#316, 317), the possibility of detecting inhibitory effects at higher chemokine concentrations appears unlikely. Consistent with the RANTES-inductive activity of HHV-6A [25, 30], the two RANTES-resistant isolates were also resistant to HHV-6A-mediated inhibition, whereas the two RANTES-inducible isolates were also HHV-6A-inducible. These results suggest that in vivo, under the selective pressure of the RANTES-rich microenvironment created by HHV-6A, SIV was driven to acquire a RANTES-resistant phenotype, thus bypassing an important mechanism of virus control. Somewhat surprisingly, resistance to RANTES was associated with a diminished replicative capacity of SIV. This finding may appear counterintuitive considering the accelerated progression of SIV disease that occurred in HHV-6A-coinfected animals. However, an optimal fitness for survival in a high-RANTES environment in vivo does not necessarily imply an equal fitness for replication in an ex vivo culture system in the presence of lower RANTES concentrations. Most likely, the acquisition of RANTES resistance/inducibility was a necessary condition for SIV to maintain sufficient levels of replication in the high-RANTES environment induced by HHV-6A coinfection in vivo. Interestingly, we found that RANTES-resistant SIV isolates suppressed the secretion of IL-2 while increasing the production of IFN-γ, two effects that may help to explain their lowered replicative capacity in lymphoid tissues. This altered cytokine profile was particularly pronounced for the two RANTES-inducible isolates, suggesting that SIV evolution in HHV-6A-coinfected animals was a progressive phenomenon. Of note, a similar phenotype has been linked to high antigenic loads and defective antigen clearance in HIV-1 infected patients, leading to faster disease progression [31, 32]. Furthermore, replication of RANTES-inducible SIV isolates was also associated with suppression of IL-12, a critical cytokine in the development of effective cell-mediated immune responses, particularly Th1-polarized responses that play an essential role in the clearance of viral infections. This could represent an additional mechanism of SIV-disease acceleration in HHV-6A-coinfected animals. The inability of SIV isolates derived from HHV-6A-coinfected macaques to grow in CCR5-Δ32+/+ CD4+ T cells unambiguously demonstrated their strict dependence on the CCR5 coreceptor for entry, in spite of their RANTES resistance. This suggested that SIV acquired the ability to interact with CCR5 in a modified fashion, insensitive or even facilitated by the presence of a bound inhibitor. Similar alterations were previously documented for HIV-1 variants selected in vitro for resistance to small-molecule CCR5 inhibitors [33, 34]. Some degree of replication in CCR5-Δ32 PBMC, indicative of alternative coreceptor usage, was instead documented with a single SIV isolate derived from singly-infected macaques (#303). Noteworthy, this isolate was derived from the only animal in the singly-infected group to progress to full-blown AIDS during the follow-up of the in vivo study . Consistent with an expanded coreceptor usage, this was also the only isolate among those derived from singly-infected animals to show a partial resistance to both HHV-6A- and RANTES-mediated inhibition. However, unlike the SIV isolates obtained from HHV-6A-coinfected animals, this virus grew in lymphoid tissue more efficiently than any of the other isolates tested. Altogether, these results indicate that also in animal #303 progression to AIDS was associated with SIV evolution toward RANTES resistance, but this evolution followed a different pathway than in animals coinfected with HHV-6A. Regardless, the rapid disease progression observed in this animal reinforces the concept that the emergence of RANTES-resistant viral variants may constitute a critical virulence factor for primate immunodeficiency viruses to evade an effective mechanism of host antiviral defense. In conclusion, our study illustrates a novel mechanism whereby coinfection with a putative AIDS-progression cofactor, the T-lymphotropic herpesvirus HHV-6A, may affect the in vivo evolution of SIV leading to an accelerated development of AIDS. Understanding the complex interactions between HHV-6A and primate immunodeficiency viruses may provide important information not only for a deeper understanding of AIDS pathogenesis, but also for the development of novel preventive and therapeutic strategies against HIV-1. We are grateful to Dr. M. Santi and the entire staff of the Department of Anatomic Pathology of Children's National Medical Center in Washington, DC, for their generous assistance in obtaining human tonsil tissues. This research was supported in part by the Intramural Research Program of the NICHD, NIH, Bethesda, MD, the EU Biomed-2 Programme, Brussels (grant no. BMH4CT961301 to P.L. ), and the ISS Italian AIDS Program, Rome (grants no. 40B.57, 50C.17, 50D.17 and 50F.23 to P.L.). AB designed and performed experiments, analyzed data, wrote manuscript; JCG designed experiments and analyzed data; AL performed experiments and analyzed data; CV analyzed data; PDM performed experiments and helped in the design of the study; RCG designed research and analyzed data; LBM designed research and analyzed data; PL designed research, analyzed data and wrote manuscript.